It's that time of the month again... for my fave finds, that is. I have so many stuff I want to share with you but I simply cannot finish all my planned posts. You can surely look forward to more exciting features in the coming weeks. I've decided to just compile a few of my favorite things at the moment, and to simply share my happiness over these fabulous finds of mine. What's even great about these goods? They are all practical and reasonably priced! I bought a pair each for myself and for the girl... and she chose the colors. I was surprised she want them 'coz she never liked thong sandals. I learned she them from a girl model in a magazine! She wanted hers to be the color of water, and so I got myself the aqua green to sort of match with hers. Would you believe this is our first mother-daughter matching footwear?! The girl is already 5.5 y.o. and wears a size 11. I got size 8. I love everything about it: it's made with "Eco Jelly" technology that's environment-friendly, classic thong style, and in fun colors. Best of all, we can wear them rain or shine. 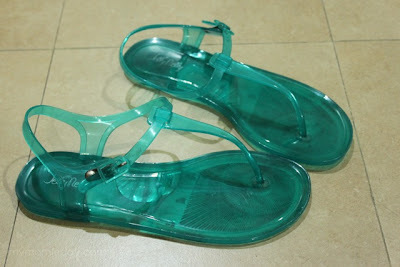 I ordered our matching Jelly Nelly sandals online at Mothering Earthlings -- currently offering delivery until Sept. 15! I suggest you get your own pair/s too! 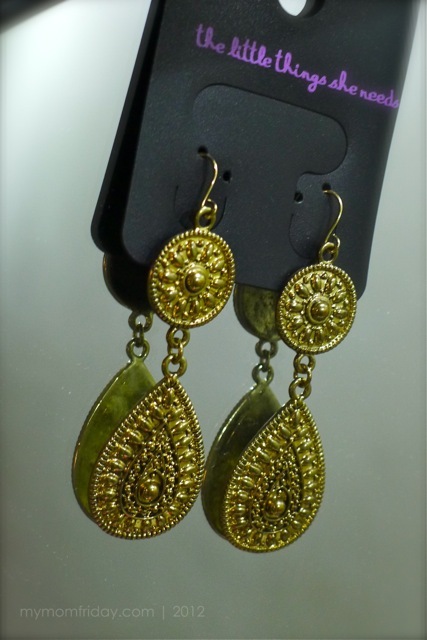 I love accessories, especially earrings and necklaces. I don't buy that often though, so when I do, I choose unique styles that can still match and complement my wardrobe. 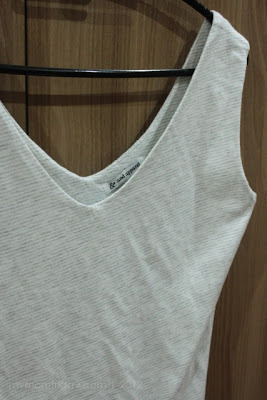 Some of my more recent purchases were from The Little Things She Needs shop at Robinson's Galleria. 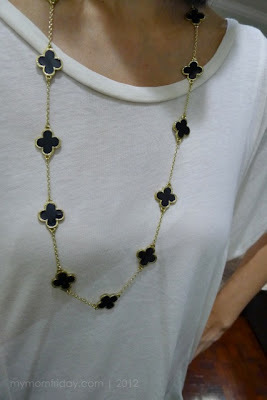 I bought these antique-style gold drop earrings, and this gold chain long necklace with four-leaf clover design. Both were on sale. I'm sorry I did not get the actual prices but I believe I got both these items for around PhP 600. For the quality and finish, I got a great deal! My friend Jann creates some very bold and pretty one-of-a-kind accessories that I just can't resist. I was looking for red pieces lately and so, I first got this striking mookaite jasper chocker last summer which I also featured with a well-received blog raffle. Every time I wear that neck piece, it never fails to get compliments. 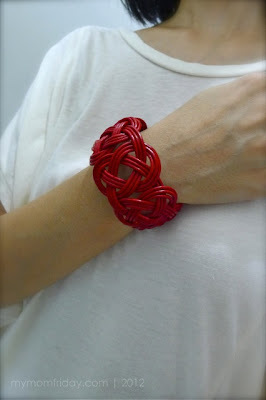 Then, she made a braided leather cuff that I also fancied. I requested for a red version. Several weeks later, she sent me this. =) It makes any plain outfit come alive. You can own one for only PhP 400. This pressed powder is my first mineral make-up. 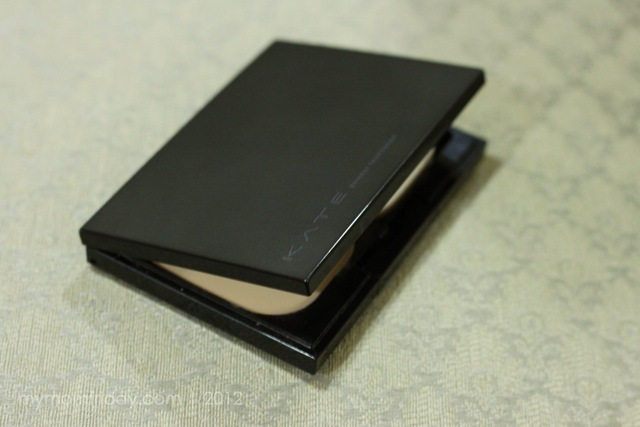 With several recommendations from friends, I ended up buying this Kate powder, made by one of my trusted cosmetics brand, Kanebo from Japan. I've been using another brand for the longest time and I thought it's time for a change since my skin has dramatically changed too (with age!). I love how very light this powder feels on my face -- seriously, I feel like I don't have face powder on. It just glides on smoothly and easily as I apply it. I noticed it is super fine, not as "creamy" as other face powders I've used. Maybe because it's mineral make-up, and it's claim is it does not clog your pores. 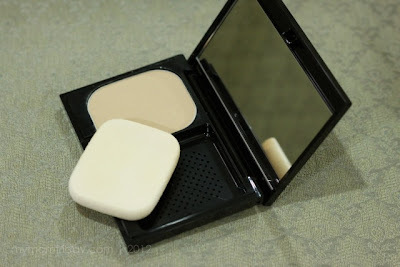 It has light to medium coverage, paraben free, fragrance free, with SPF15, and is available in refills too. It's not cheap, but I know it's worth it. 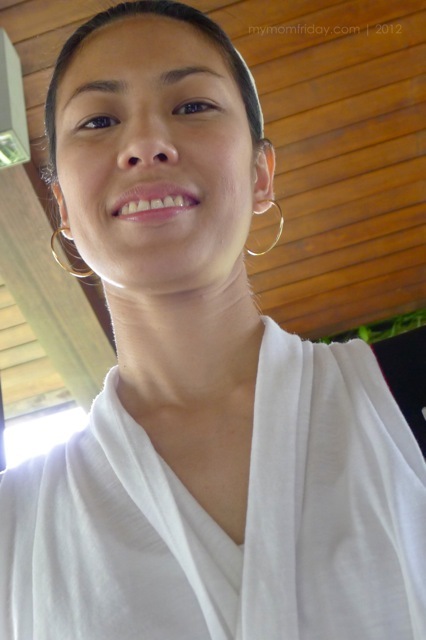 This was taken by my girl during our recent weekend getaway to Anvaya Cove. I'm so glad the powder covered my blemishes and dark circles and I think I still looked fresh here even after only a few hours of sleep! 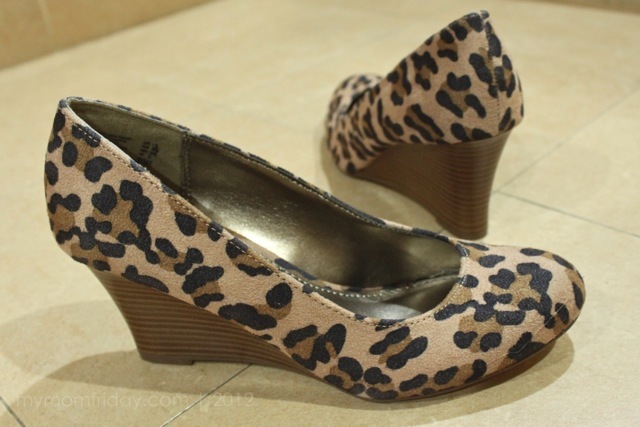 I guess the top photo gave it away already -- here's my leopard-print wedge pump. 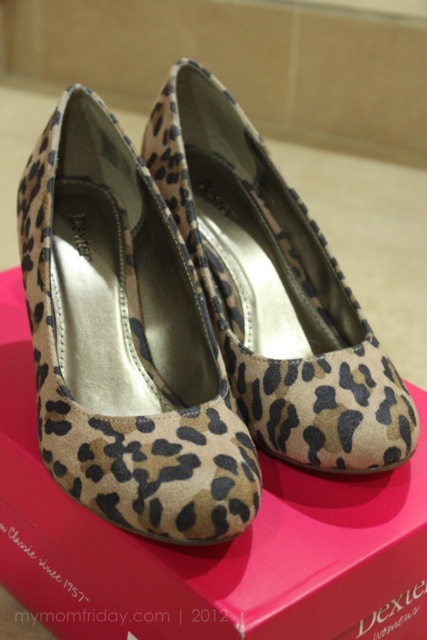 I've been lusting over this pair for months ever since I saw it on the display window of Payless Shoes. I've always liked round-toe shoes. 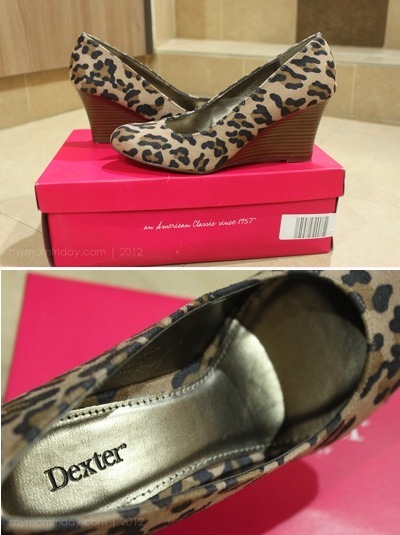 What made this harder to resist is the animal print, the suede-like material, trademark Dexter comfort, and a perfect heel height for me. It's affordable too so this is one great buy for me! You see, I stand 5 feet, 6.25 inches to be exact. I like wearing heels. 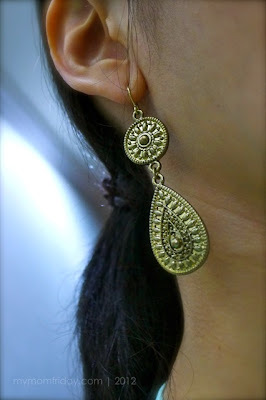 When I was an office girl, I can wear them everyday. I still own a few 4-inch-heel shoes, but I rarely wear them these days. Now, I really feel like a pole towering most people when I wear heels, and feel weird in them without any occasion or a business meeting. This pair falls a bit shorter and is casual enough to wear with my usual jeans get-up. And it's surprisingly light too! I know it will instantly give that oomph to my simple look. I'm a very, very happy lady! 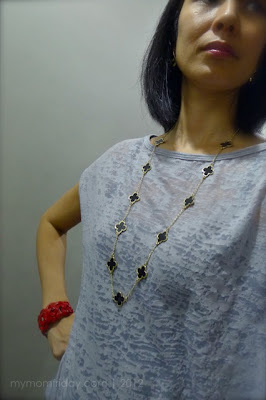 How do you like my fave finds? Care to share your latest shopping finds?